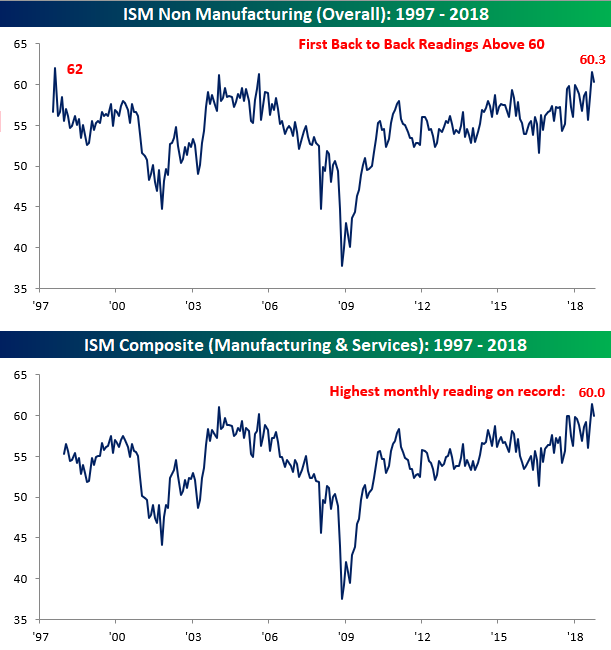 The ISM Services report for the month of October declined less than expected, falling from 61.6 down to 60.3 compared to expectations for a reading of 59.0. Even though the pace of growth declined, though, it was the first time in the history of the report dating back to 1997 that the headline index posted back to back readings above 60. 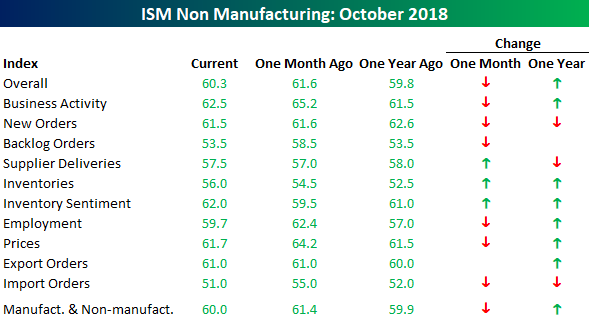 With both the manufacturing and services data now in, accounting for each sector’s weight in the overall economy, the October Composite ISM fell from 61.4 down to a still very high reading of 60.0. Since composite data for the index begins in the late 1990s, there have only been four readings of 60 or above, and two of them came in the last two months! The table below breaks down this month’s report by each of its sub-components and shows how they stand relative to September and last October. On a m/m basis, breadth in this month’s report was weak with just three categories showing m/m increases, while Backlog Orders and Import Orders saw the largest declines. On a y/y basis, things look considerably better as the only components down were New Orders, Import Orders, and Supplier Deliveries.